I've been grocery shopping since I was a teenager. As my mom's real estate career took off and she had to work late at times, my dad and my sister and I became very domestic. Dad learned to cook, I started reading cookbooks and Katherine and I did all the shopping. When he decided to teach himself to cook, my dad went all out. He didn't have any interest in making french toast for supper or making a killer spaghetti and meatballs. No, he decided to cook the dishes he likes to order in a restaurant, so it was Veal Oscar and Lamb Chops with Pesto Cream for us! He'd come up with some dishes and my sister and I made the list for those meals and all the other stuff in between. Armed with that list and a blank check, we'd hit the Irmo Winn Dixie and shop away. Interestingly enough, even though we had a blank check with us, we became meticulous label readers and comparison shoppers. Each week we would come home, unload all the bags onto the counter so we could visually survey just how much we'd been able to buy for (our) money. This was such a valuable experience and education for us, I can't even adequately put it into words. And it carried us into and has remained with us through our adulthood. Just the other day, I had occasion to see just how much this really has stuck with me. I needed cayenne pepper. As I often do, I stand in front of the spice area in the store and start scanning the shelves from top to bottom. I've known for a long time now that this is an area of HUGE profit in the grocery biz. Most people arrive at the spices, spot what they need, conveniently right at eye level, pick it up, toss it in the basket and off they go. NO! BACK UP! YOU'RE DOING IT WRONG! That's exactly what "they" want you to do! Packaged herbs and spices are one of the biggest rackets in the grocery industry. 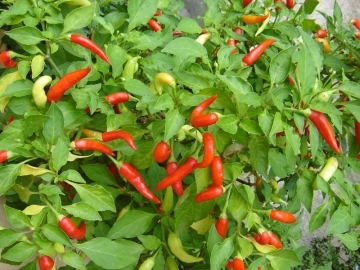 If you've ever grown herbs yourself, you know how little it costs. Most major grocery chains have their own private label, which I truly believe all come from the same place. For the most part, they carry the usual suspects (basil, oregano, sage, garlic powder, etc.) and some of the more interesting and special herbs and spices. Then, there are the pretty little glass jars that attract most people's attention. They look much prettier than the grocery store brand and they are much more interesting than the old school ones that are still in the little metal canisters that we all remember from the 60's & 70's. I imagine it being like that scene in "Finding Nemo" when Marlin & Dory happen across the spooky, terrifying fish with the hypnotic light on the end of its antennae...it's so pretty. 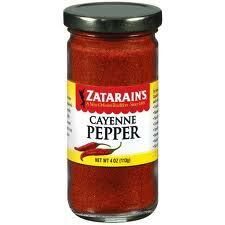 So, most folks see the pretty little bottles, grab that cayenne and continue on without a second thought. If you continue scanning those shelves, like I did the other day, you may find some pleasant surprises. In this case, I wanted cayenne pepper. The little glass jar of pepper (at eye level) was $4.49. Just one shelf down (about hip level) was Zatarain's cayenne for $1.49. Same number of ounces, same ingredient, different shelf, dramatically different price. See, that's what "they" are banking on. They have studied our nature and know that most people will spot what they seek, grab it and go. But, seriously, a $3.00 difference? It's simple robbery on the spice route! Look one shelf down and you'll encounter the special blends such as "Cajun spice," "blackening" spice, or "Creole" spice. The price tag is offensive to me. Read the label and you'll probably find that you have all those spices at home in your cabinet right now. You don't need a sketch of Prudhomme on the label to make it authentic. But,the advertising and marketing geniuses are betting that you either don't know this or are too lazy to mix up your own stuff. Ok, I have one concession to this rant. Maybe you (I, we, they) are simply too busy or just not inclined to spend this time or attention to this matter. No big deal. Do your own thing, ride your own ride. But, if you're like me most of the time, I want to find the true value, the true deal and spend an honest buck. If that's you, devote about 5-10 minutes to really check out your grocery store's herb/spice aisle. You may be surprised and enlightened by what you discover. OMG, I have missed you people! Before we go any further, I want you to take a moment to hug your computer. Hug it tight. Even if it's old or slow or makes a lot of noise. Hug it and tell it how much you appreciate it. I love you. I do. I will never complain about you again! You see, I have been home-computer-less for about 3 weeks now. I have 2 laptops in this house that have both just gone to hell. My old workhorse back-up computer then lost its wireless adapter "dongle" to apparent suicide. The first few days were the worst. I really thought I might actually die. I realized very quickly how much I rely on computers. I don't own a phone book anymore, checking Vivian's progress at school can be viewed online, I look up recipes constantly, when I see a URL in a magazine I just have to look it up. Now. Enter Time Warner. Got a brand new, newest model modem on Thursday. Got advice on what to buy for my old clunker desktop computer and promptly went out of town. Upon returning, I realized the iPhone still wasn't connecting. I ran out and bought a wireless adapter, plugged it in and (of course) there were problems. So, Time Warner sent one man today who was later joined by the guy from last week and an hour and a half later, they have me back up and running. This was a really long way of telling you that I'm back, Jack (as Uncle Si would say.) I have nothing food related to share with you today, as my mind is still reeling from the reintroduction of Internet magic to this house. But, I will tell you I've been gathering some information for a not-too-distant-future post that I think you'll all get a kick out of. So, stay tuned! That reminds me...I need your help. Will you please ask friends of yours to "like" my page on Facebook? I need more "followers" in order to qualify for some of the cool giveaways that keep coming my way. Then, I'll have fun posting those for you guys to win cool prizes, products, swag, etc. www.facebook.com/gastronomybyawannabechef.